Hi again! 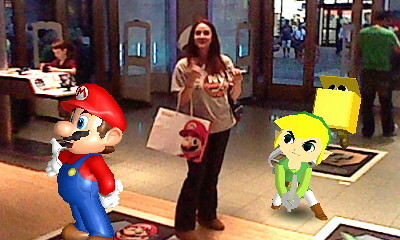 This past weekend I went with my bf JDubs to the Nintendo World Store in NYC! He’d never been there before, so it was extra fun to take him for the first time. First thing we noticed was a Star Fox photo op thingy! Of course I had to jump in there and practice my “make a stupid face” photo modeling techniques. Next we went upstairs where I found an amazingly cute Kirby shirt. It was a youth-sized shirt but I managed to find one that fits me and it’s ADORABLE! Again… photo pending. I didn’t take a pic at the time lol. It’s so great tho, you’ll all be jealous. Link showing me his Rupee. Innit so cute?? I am still working on taking some cute AR Halloween photos. Keep on the lookout for that. OK I’ll post more later! 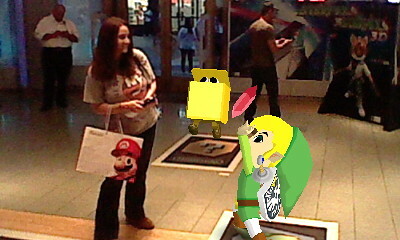 It was an awesome time and I recommend everyone get their butts over to the Nintendo World Store in NYC! Pokémon Rumble Blast Launch Events!